Two months ago, I posted about a Google announcement that they had made a breakthrough in improving Google Translate (Google Says They Just Achieved A Huge Breakthrough In Machine Translation) and that they expected to roll changes out among its languages. It looks like they might have accelerated those changes, and you can read all about it in a massive New York Times article published today, The Great A.I. Awakening. The improvements seem absolutely amazing. The Times article goes into excruciating detail about how the changes have been achieved. To be honest, I’m less interested in the “how” and more interested in its reality. It just makes it so much easier to ELL teachers to communicate with parents and with newcomer students! 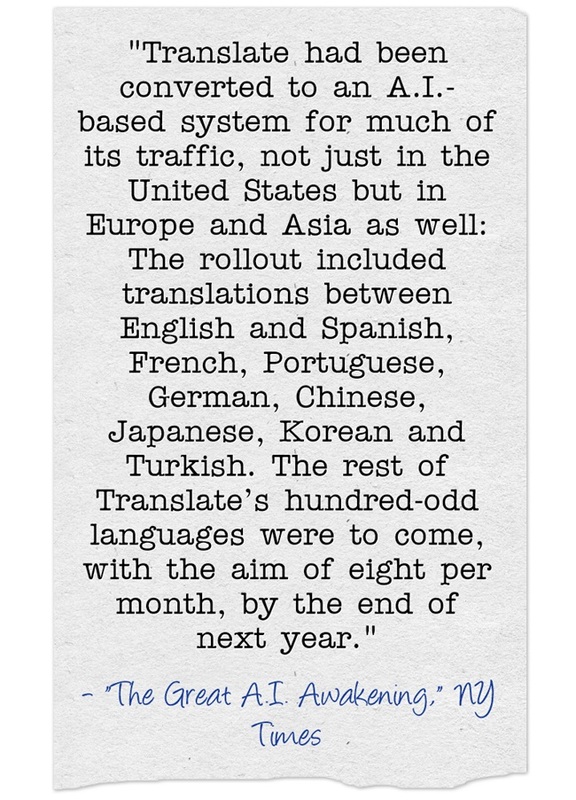 I’m adding this info to The Best Sites For Learning About Google Translate & Other Forms Of Machine Translation.